“Prisoners of hope.” It’s not a phrase you hear very often. Prison, especially in the ancient world in which these words were written, is not a place one normally associates with hope. Yet here is the phrase, in the middle of a prophecy (Zechariah 9:9-12) that held hope for the exiled Israelites and holds hope for us today. It is a Messianic prophecy—the foretelling of a coming Messiah, a savior—fulfilled in part on that first “palm Sunday” when Jesus rode into Jerusalem on the foal of a donkey. But as is true with so many Biblical prophecies, this, too, finds its fulfillment both Now and Not Yet; it has been fulfilled, and it is yet to be fulfilled. For while Jesus the Messiah did indeed “speak peace to the nations,” his rule is not yet “from sea to sea and from the [Euphrates] River to the ends of the earth” (verse 10). That is what we long for: peace. Messiah’s rule. We long for an end to war and the flag-draped caskets we receive in return. We long for an end to the threat and fear of more war, of bigger, badder wars. We long for an end to violence against women and innocent children, the broken homes and broken lives left in the wake of that violence. We long for an end to racism, to the wrongs done to men and women only because of their skin color or birthplace. We long to send our children to school without wondering whether theirs will be the next to be ripped apart by gunfire on national television. Today we celebrate the hope of Palm Sunday. But just as the partying crowds some 2,000 years ago were blissfully unaware of the brutal death just five days away, so we, too, shut our eyes to the death that surrounds us. We long for peace … but just like those long-ago crowds—who wanted Jesus to throw off the Roman occupiers—we put our hope in laws and and lawmakers and governments instead of in the Prince of Peace. We are prisoners indeed, but not prisoners of hope if our hopes are set on these long-failed institutions. And just as Zechariah’s prophecy was fulfilled in Jesus then but is still yet to be fulfilled, we can bring peace to our world now even while we wait for peace to come finally in Jesus Christ. Prayer is needed, but prayer is not enough. Laws are not enough, but laws are needed. Today, on Palm Sunday, if you profess to follow Jesus Christ, speak out for peace in Him – and for peace in our nation – and for peace in our world. Let your worship of the Prince of Peace not be undermined by your worship of a weapon of war. This entry was posted in Uncategorized on March 25, 2018 by Randy Ehle. It’s only been a couple years, but somehow it seems longer – and somehow much shorter. Two years after stepping in front of a classroom for the first time, that part of my journey is coming to an end. Soon I will be back to a different kind of teaching, as a pastor, leaving this role of teaching, which I have discovered to be a different kind of pastoring. Living on only in my memories and a few hastily-scribbled notes will be several hundred kids whose lives have been woven briefly into mine. If my whole life were to be displayed as a tapestry, this time, these kids, would be mere threads…yet they would stand out bright in the midst of an otherwise dark spot somewhere in the middle of that image. As is the norm for substitutes, most of my assignments were for just a day or maybe two. Often, my role seemed more babysitter or classroom monitor than teacher. The day was a success if no one got hurt; if they actually learned history or math or what “obligation” means, that was a bonus. My biggest hope on those days was that students would have what a mentor of mine calls collisions with righteousness: a fresh breath, a teacher who didn’t belittle him; a teacher who saw through her teenage mask to the value and potential hidden within. But twice I was given the chance to be with classes for multiple weeks, first with fourth graders and then with seventh. Each time I got to know more than a hundred students, learning their names, matching them to faces that will long be engraved on my heart. I learned how hard is the work of a teacher – work that goes far beyond the labor of planning lessons, clawing coherent sentences out of kids who prefer video games and sports and dance over agriculture and urbanization in medieval China. And, of course, we’ve had some fun. While role playing scenes from Imperial China we met the fictitious Empress Ping Pong (or was it Empress Ping from the Pong Dynasty?). 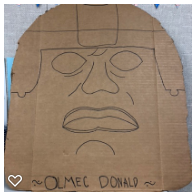 When we moved to Central America to learn about the Maya and the civilizations that influenced them, like the Olmec, we met an anthropologist named Don, immortalized in a familiar song: “Olmec Donald had a farm….” We’ve learned about cultural exchange, cultural diffusion … and, well, cultural confusion (which is what happens when seventh graders suggest that Europe’s knights were led by people from Japan!). When I stepped out of the classroom on my last day, I said good-bye not just to the 127 kids I’ve been with most recently, but to all those who have loved, accepted, laughed with, and maybe even learned with me: Cassie, Clara, Nick. Emma and Emily. “Mad Dog” Madison, Duncan, Mohammed, Muhammed, Yousif (all of them!). The 3rd graders from Ms. Bradbury’s class, 10th grade Honors English students at Christian High, all the kids in 3rd through 8th grades at Fuerte and Hillsdale and LFCS. The students at my daughters’ (and niece’s) school who call me not just Mr. Ehle, but Father, Dad, and Uncle Randy. To all of you, I say: Thank you. Gracias. Danke. Arigato. Merci. Shukran. This entry was posted in Uncategorized on March 23, 2018 by Randy Ehle.